Crude prices jumped to $78 per barrel and then tilted back. Crude prices have surged more than 60% since March. The Organization of Petroleum Exporting Countries and the U.S. Energy Information Administration recently boosted their demand outlook for next year, as the global economy gradually recovers from the recession. In this article we will figure out the trend and the original invisible facts of where the crude prices will climb in the coming days.The below chart shows the crude price in 1 year time frame. Opec raised its 2010 global oil-consumption estimate on expansion in emerging economies. The International Energy Agency (IEA) last week upgraded its demand prediction. 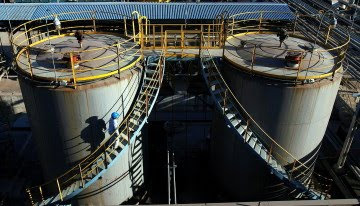 Total crude consumption will increase 700,000 barrels a day to 84.93 million barrels a day next year, led by demand from emerging markets, Opec said in a monthly report. That’s 370,000 barrels a day higher than the group’s previous forecast. This year, the group estimates demand will contract by 1.4 million barrels a day to 84.24 million barrels a day. This reveals the level of optimism the opec and IEA is having on the 2010 economy. We find that oil prices remained in the range of $50 from 1998 to 2004 mid. After that we find the crude prices going up and creating a history of all time high in the year 2008 at $147. In the coming days we might crude prices soaring again backed by two important influential factors. 1. As dollar has fallen against all currencies import of crude in US will make it advantageous for US to build huge inventory of crude. This will work in favor of them when the world economy will come out of completely out of recession and economic growth comes back to normal procedure. At that point of time crude imported at low priced dollar valuation will give US a much competitive cost benefit. We find below the chart which reflect the growing inventory built up of US economy in the past. More US will go for storage of crude oil the more prices will go up in the coming days. Since US is already having its fiscal deficit which comprises of many things among which huge import bill of crude is also prime contributor. So doing investment in building inventory of crude at this point of time when dollar has fallen will give prune cost competitiveness once US economy comes out of the dark woods. Now many will argue with me that this advantage ball game will be played by all countries. I would like to make them clear that US remains one of the most highest ranked country of crude import.The chart below shows the Net US import of crude which results to increased import bill of US. 2. The prospect of rising demand in emerging economies should once again provide support for oil prices – just as rapid growth in China, India and the Middle East contributed to the run up between 2003 and 2008 that resulted in record oil prices of $147 (U.S.) a barrel. China's faster-than-expected recovery should boost demand in both 2009 and 2010. China's oil consumption doubled in the last decade, rising to 8 million barrels a day last year from 4.2 million barrels in 1998, Chinese oil demand was revised upward to 8.17 million bpd for 2009 from a previous estimate of 8.08 million bpd, according to the International Energy Agency. Crude oil imports in January-August period went up 7.4% from earlier. And demand is accelerating. China's oil imports rose 18% in August. China's car sales are booming — up 78% in September from a year earlier. We may not find good numbers of auto sales in US as they are struggling with auto sector but in the coming days US will be one of the largest consumer of crude as they have been in the past. For the current time India and China will dominate the automobile market which will result to more demand of Crude oil. So the forecast was revised for global crude consumption this year and next, based largely on China's resurgent economy and giving even more support for oil prices that have jumped on the back of a weakened U.S. dollar. U.S. gasoline deliveries in September continued to build on the strengthening trend seen over the summer months, perhaps a sign that a glimmer of life has been breathed back into the economy which notices 6.6% increase in gasoline deliveries for this September, compared with a year ago. The Energy Information Administration expects America's oil demand to fall by 330,000 barrels per day (bpd) in the fourth quarter from a year earlier. This fall is due to the less consumption by consumers as they are facing rising of unemployment, weak income growth and too much debt. The EIA recently revised upward its estimate for U.S. oil consumption in 2010, expecting demand to increase by 320,000 bpd over 2009.So this will result to building up of inventory. Oil reserves and extraction updates. India imports large crude oil cargoes from Kuwait, Saudi Arabia and Iraq. We find that there will be new oil discoveries in the future, but the focus is increasingly upon the extraction of more oil from existing fields. There is certainly scope to do so. Currently only about 30%-35% of all the oil held by the average reservoir is brought to the surface. In addition to maintaining the pressure within the reservoir, techniques are deployed that change its characteristics. This will cost money as with these many initiatives in the oil business their deployment depends upon economics and, ultimately, the price at which oil can be sold. Even in the Middle East, where oil is still plentiful, these techniques are being adopted. Kuwait wants to boost its output from 3mbpd to 4mbpd and has invited oil companies to suggest ways of applying the new techniques of oil exploration . 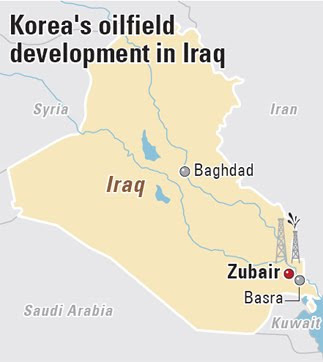 Korea is tapping into the world’s third largest oil reserves of Iraq. State-run Korea Gas Corp. is teaming up with Italy’s Eni Group, U.S. Occidental Petroleum Corp. and Iraq’s Southern Oil Co. for the 20-year production management rights of an oil field.The below picture belongs to the oil field where Korea is tapping. It can be concluded that crude prices will climb to $100 dollar in the 2nd quarter of 2010 on the growing factors of high demand and building inventory of crude by not only US but also by major countries building inventory of crude. Those who plans to do investment in crude can start doing their investment in crude futures and keep a hold of their positions and book particularly the long term investors.But before all these we will get some correction in crude prices in the coming days due to sentimental break up.The correction will take place mainly for US and China illusion recovery ball game.Where we find US will take more time than its predicted time to come out of recession.China is running on the wheels of over capacity which is a bubble going to burst out in coming days.So once these nightmares get over and we get further clear picture crude might correct to $70 and then rise back to $100 in the 2nd quarter of 2010.So wait and build your crude portfolio and hold it to reap the longterm price apprecaition that will result from higher demand. Current Heating Oil Prices,Home Nozzles Oil Burner,Home Oil Deliveries maintaining the reserves where excessive amount of oil has been kept preserved for critical days.